Snug Cove House is the dream of a dedicated group of Bowen Islanders who have worked for more than 20 years to develop a sustainable response to the need for supportive housing for Bowen Seniors. This dream will be financed in part by the sale of some of the original Snug Cove House land. If you are interested in purchasing one of these affordable building lots close to the heart of Snug Cove, please see our separate website Villagebythecove.ca. For more information on Snug Cove House itself, read on. While these dreams are still in the formation phase and subject to change, we plan that the seniors’ residence will provide studio, 1 and 2 bedroom suites for seniors who wish to live in community, with some support services offered. The House will be staffed with a House Manager, as well as other staff positions and many volunteers. One full meal, and a lighter supper will be provided in the communal dining room, through a contract with a local caterer. The staff onsite would provide oversight but not medical duties to the residents, and there will be guidelines supervised by a medical team for entry and continuing residency conditions. The house will include not only 2-bedroom, 1-bedroom and studio suites on three levels, but a communal gathering place of a combination dining and living room, as well as a small lounge/library; there will be roof gardens and decks where residents can enjoy the glorious views of the Crippen park forest surrounding the house. 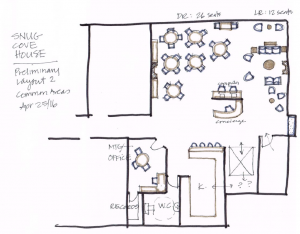 We plan to have 2 small studio suites which can serve a variety of purposes: as a respite suite for a caregiver, for temporary accessible housing for someone recovering from surgery or illness, for a trial visit of someone considering the move to Snug Cove House, as well as other uses. The House will include an elevator to give access to all levels. 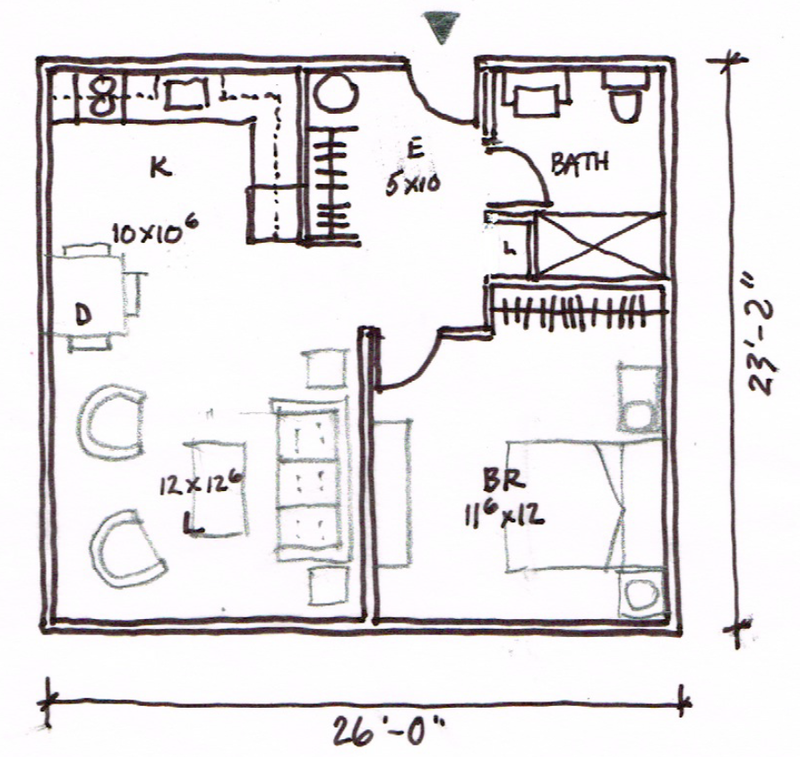 Each suite will be a self-contained unit, with a modest kitchen, full bathroom (which might be reworked for accessibility), and (apart from the studios) separate one or two bedrooms with closets. Each floor will have laundry facilities for residents to wash their personal items, and “flat linens” will be washed weekly, along with in suite housekeeping. As well, there will be a full kitchen on the top floor, which residents or their guests and families might use, depending on the schedule of usage in the house. 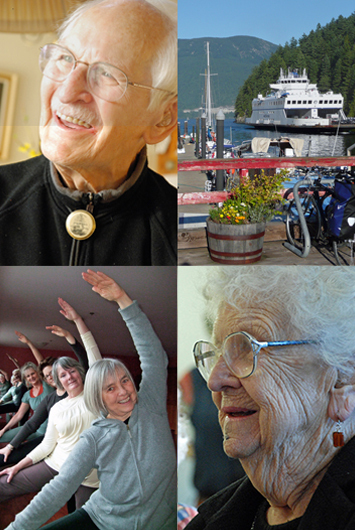 Overall, our hope is to create a sense of supportive community for seniors who want a closer sense of involvement with the island, and particularly Snug Cove, and who are still able to manage fairly independently. Snug Cove House is located within walking or scooter distance of the amenities of Snug Cove: the pharmacy, the post office, the library, grocery stores, and soon the new Fire Hall. The residence will be adjacent to Bowen Court where many seniors live independently in community. The house is on the bus route to the village, and very close to both the Ambulance Station and the RCMP headquarters for the island. There’ll be a pedestrian crossing across Miller Road, which has one of the few sidewalks on the island and has a 30 kilometre an hour speed limit, which will make travel down to the village a quick and safe journey for Snug Cove House residents. Rents for the house are intended to meet the tests of affordability for Bowen Island. 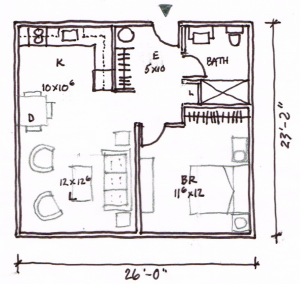 This sketch shows the likely layout of a one bedroom suite. 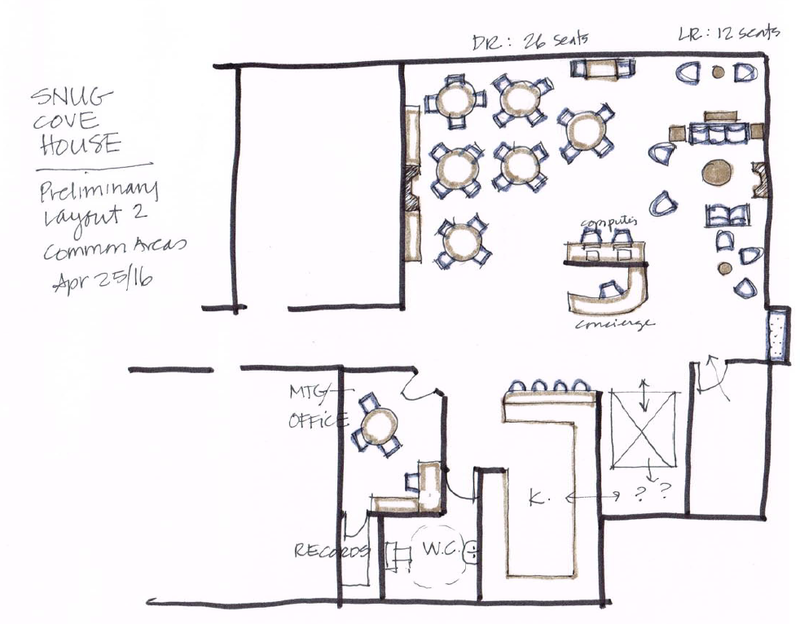 This sketch shows the possible layout of the common areas on the top floor of the residence. For more information or to place your name, or the name of a relative on our Waiting List, please Contact Us.